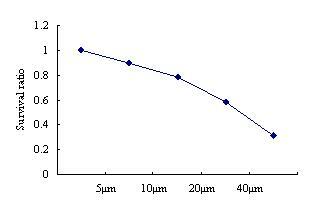 The solubility of this peptide in sterile water is >0.5mg/ml. Stock solution should be splited and stored at -80°C for several months. To investigate the involvement of the tau phosphorylation kinases in Aβ (25–35)-induced tau phosphorylation, the level of each kinase was determined after Aβ (25–35) (20μM) exposure for various periods. GSK-3α did not show a significant change in response to Aβ (25–35), whereas MAP kinase decreased to ~ 60% of the control after 6h Aβ (25–35) exposure, when tau was phosphorylated maximally. TPK I/GSK-3βrapidly increased in response to Aβ (25–35), reaching a maximum (2.2-fold the control) at 6 h.
A statistically significant decrease in basal ACh release (-28%) was detected one week after the injection of Aβ (25–35). The effect persisted for only two week. K+-stimulated ACh release was similarly affected by the treatment. Aβ (25–35) treatment induced a statistically significant decrease in the stimulated release on day 14 after lesioning (-45%). Amyloid- β (Aβ) peptide is commonly found in human Alzheimer’s disease (AD) brain and is the main component of Alzheimer amyloid plaques. 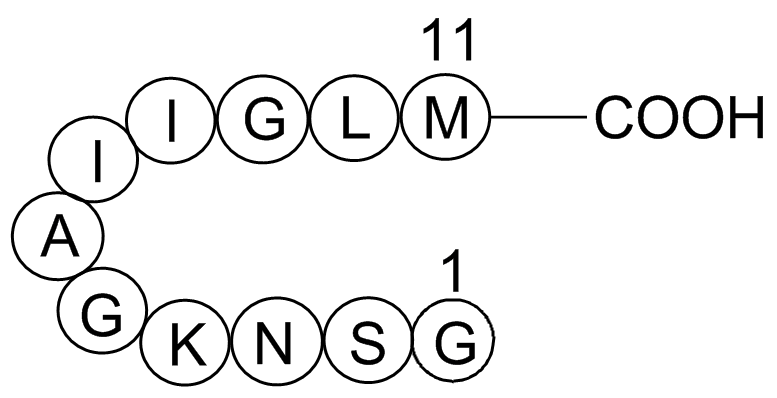 The predominant forms of Aβ in the human brain are Aβ (1-40) and Aβ (1-42). However, the Aβ (25-35) fragment, which is physiologically present in elderly people, is the more toxic region and has recently been found to play a relevant role in AD due to its peculiar aggregation properties1. Aβ (25-35) is regarded to be the functional domain of Aβ, responsible for its neurotoxic properties2-5. It represents the actual biologically active region of Aβ6. Administration of Aβ (25-35) has been shown to lead to amnesia in mice, causing impairments of spatial working memory along with the degradation of passive avoidance reactions2-5. In vivo, Aβ (25-35) is present in neurons of subiculum and entorhinal cortex of AD brains7. It is also observed in Inclusion-Body Myositis (IBM) muscle8.